Harold Brown is a Columbia-educated scientist and former President of the California Institute of Technology (1969-1977). He is also a former U.S. Secretary of Defense (1977-1981) and former Director of Lawrence Livermore National Laboratory (1960-1961). Other institutional affiliations include University of California at Berkeley and Johns Hopkins University. September 19, 1927Birth, New York (N.Y.). 1945Obtained BA, Columbia University, New York (N.Y.). 1946Obtained MA, Columbia University, New York (N.Y.). 1947 – 1950Lecturer and Research Assistant, Columbia University, New York (N.Y.). 1949Obtained PhD in Physics, Columbia University, New York (N.Y.). 1949 – 1950Lecturer, Stevens Institute of Technology. 1950 – 1952Physicist, Radiation Laboratory, University of California, Berkeley. 1952 – 1961Physicist (1952-1953); Group Leader (1953-1955); Division Leader (1955-1958); Associate Director (1958-1959); Deputy Director (1959-1960); and Director (1960-1961), Lawrence Livermore Laboratory, Livermore (Calif.). 1956 – 1958Member, Polaris Steering Committee, United States Navy. 1956 – 1961Member, Scientific Advisory Board, United States Air Force. 1958Adviser to the United States Delegation, Conference of Experts on the Detection of Nuclear Weapons Tests, Geneva. 1958 – 1959Senior Scientific Adviser to the United States Delegation, Conference on the Discontinuance of Nuclear Weapons Tests. 1958 – 1961Member, Scientific Advisory Committee to the Secretary of Defense on Ballistic Missiles, United States Department of Defense. 1961Member, President's Science Advisory Committee (PSAC). 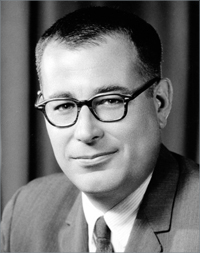 1961 – 1965Director of Defense Research and Engineering, United States Department of Defense. 1965 – 1969Secretary of the Air Force, United States Air Force. 1969 – 1976Member, General Advisory Committee, United States Arms Control and Disarmament Agency. 1969 – 1977Delegate, Strategic Arms Limitation Talks. 1969 – 1977President, California Institute of Technology, Pasadena (Calif.). 1973 – 1976Member, Executive Committee, Trilateral Commission. 1974 – 1975Chair, Technology Assessment Advisory Council, Office of Technology Assessment, United States Congress. 1977Member, National Academy of Sciences. 1977 – 1981Secretary of Defense, United States Department of Defense. 1981 – 1992Distiguished Visiting Professor, Paul H. Nitze School of Advanced International Studies (1981-1984) and Chair, Foreign Policy Institute, Paul H. Nitze School of Advanced International Studies (1984-1992), Johns Hopkins University, Washington (D.C.). 1983 – 1992Member, Board of Trustees, RAND Corporation. 1992Awarded Enrico Fermi Award, United States Department of Energy. 1992 – presentCounselor and Member, Board of Trustees, Center for Strategic and International Studies, Washington (D.C.). Ballistic missile defenses -- United States. Both employed at Johns Hopkins University. Obtained BA (1945), MA (1946), and PhD (1949). Lecturer and Research Assistant. Physicist; Group Leader; Division Leader; Associate Director; Deputy Director; and Director (Livermore campus). Distiguished Visiting Professor and Chair, Foreign Policy Institute. Secretary of the Air Force and Member, Scientific Advisory Board. Secretary of Defense; Director of Defense Research and Engineering; and Member, Scientific Advisory Committee to the Secretary of Defense on Ballistic Missiles. Counselor and Member, Board of Trustees. Senior Scientific Adviser to the United States Delegation. Chair, Technology Assessment Advisory Council. Received 1992 Enrico Fermi Award. Harold Brown Oral History Interview - JFK #1, 7/9/1964. International Science and Technology Journal interviews, 1962-1967. Oral history interview with Herbert F. York, 1986 February 7. Oral history interview with Jack P. Ruina, 1991 August 8. Oral History interview with Robert F. Bacher, 1981, 1983.